LONDON, UK, April 13th, 2018 — Since its release last year, AMD’s Ryzen™ platform reinvigorated the desktop with multithreaded horsepower plus accessible overclocking and gaming prowess. That first wave was a market revelation that touched everything from value-packed PCs to high-end gaming and content creation rigs. And now ASUS is ready for the second wave with a fresh family of motherboards based on the new AMD X470 chipset. The X470 chipset is designed to enhance the performance of the next generation AMD Ryzen 2000 series of processors code-named Pinnacle Ridge and yet retains backward compatibility with current Ryzen processors. The new X470 Series spans six motherboards, each with a unique spirit. The ROG Crosshair VII Hero and its WiFi twin lead the lineup with a stealthy design for serious overclockers, savvy enthusiasts and gamers. Its Strix X470-F Gaming sibling makes ROG enhancements like easy tuning and next-level customization more affordable, while the Strix X470-I Gaming shrinks everything down to mini-ITX proportions for powerhouse small-form-factor systems. The TUF X470-PLUS Gaming features military-grade components and an alliance of industry partners with a focus on functional integration that goes beyond cosmetic matching. Outside the increasingly dominant gaming sphere, the Prime X470-PRO provides a mature alternative for the content creation and everyday productivity audience with a new level of user refinement and a design inspired by futuristic architecture. Despite differences within the series, the ASUS X470 Series is bound together by common features and capabilities honed over nearly 30 years of ASUS motherboards. From tuning to cooling to personalisation, it’s designed to help users maximise their PC’s potential. AMD’s Ryzen revival promises faster performance than the previous generation, and the abundance of models with unlocked multipliers gives users the freedom to push beyond stock speeds. Even with the luxury of unlocked multipliers, CPU overclocking is limited by cooling and the individual characteristics of each chip. With a single click, the 5-Way Optimisation utility accounts for both by automatically tuning fans and testing the limits of the CPU. Its integrated intelligence finds the maximum speed the system can sustain without sacrificing stability, and configurable options allow experts to fine-tune the process to suit their needs. Auto-tuning is backed by extensive manual tweaking options that, in experienced hands, can wring every last drop of performance from a build. A new search shortcut to the UEFI lets users quickly find and modify specific settings without flipping through pages of menus. Once their setup is dialled in, they can export the profile to share with others, and keep a copy to reload after firmware updates wipe the slate clean. The integrated EZ Flash 3 tool simplifies firmware flashing by automatically downloading and applying the latest update entirely within the UEFI. Capable cooling is critical to both reaching and preserving peak performance, especially with Ryzen’s increasingly aggressive XFR clock-scaling algorithm opening the taps when thermal headroom allows. To minimise the accompanying acoustic footprint, airflow should be applied judiciously, only where and when it’s needed. The X470 lineup lays the foundation with a collection of cooling headers for liquid and air. At least one header on each board is configured for AIO water coolers, so users can plug in and go without additional steps, and some models have additional headers for high-amperage pumps and liquid sensors. Connecting fans is just as easy; all the onboard headers automatically adjust for three-pin DC and four-pin PWM hardware, and the built-in calibration routine runs through each fan’s full RPM range to precisely map its behaviour before users adjust the response curve. ASUS X470 based motherboards are available for pre-order in most regions starting on April 13, 2018. The ASUS X470 family of motherboards will be available worldwide at leading resellers starting on April 19, 2018. Please visit ASUS or contact your local ASUS representative for further information. 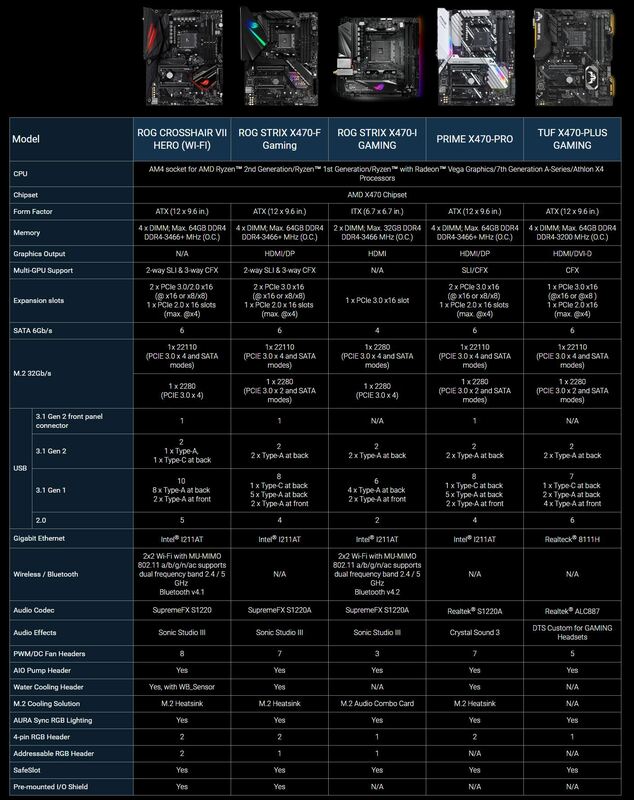 For additional information, product images and specifics on the ROG, ROG Strix, Prime and TUF Gaming motherboards, please check out our buyer’s guide at ASUS EdgeUp. Additional images and in-depth overview our latest ROG and ROG Strix motherboards are located at ASUS ROG.